I wish I'd heard about The Hunger Challenge last month while it was going on last month. These days any challenge that helps me save money is exactly what I need! The goal was to live on $3 per day for a week just as the average family who lives on food stamps have to do. Browsing through recipes from some of the bloggers who participated in the first Hunger Challenge really spurred me on to get creative and save some money on my food bill. When I saw this recipe I knew it would be perfect for us. Mainly because we all lo ve pizza around here but also because Pillsbury recently sent me a coupon to try their new thin crust refrigerated pizza crust. Using the pre-made rectangular pizza crust made this recipe a breeze. I just unrolled the dough, topped it with pasta sauce and shredded cheese. Added some baby spinach and some leftover Kalamata olives and rolled it up. Prep time was probably less than 5 minutes. Definitely a good recipe to keep around for those hectic nights coming up since ... ds made his 7th grade basketball team! Woohoo! Go ds! I can see that we'll be using these Pillsbury Pizza Crusts more often around here. I prefer my own crust but you can't beat the convenience of having a ready-made crust in the fridge. You can have a fresh, homemade pizza on the table in less than 30 minutes from start to finish. Definitely a lifesaver on those busy weeknights. If anyone would like to try Pillsbury's new Thin Crust Pizza Crust, either email me at imrunningtoeat (at) gmail.com or leave a comment below with your email address and I'll email you a coupon so you can try it for yourself! Preheat oven to 400 degrees F. Grease an 8-inch-round metal baking pan. Roll dough out into a rectangle shape, about 10 x 12 inches. Spread sauce on top. Sprinkle with half the cheese. Top with spinach leaves (kids can help arrange) and sprinkle with olives. Starting with shorter end, roll dough into a tube, with all sauce and toppings inside. You may have to lengthen and even out the dough roll. Carefully transfer roll to a cutting board. Using a sharp knife, make hard quick crosswise cuts to slice through dough, preventing dough from mashing and sauce spilling out. Cut log in half, then each half in half, then each quarter in half again, so you have 8 equal pieces. 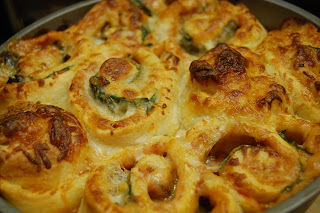 Reshape dough wheels and arrange in baking pan, leaving about ½ to 1 inch between each wheel, so they can expand and rise and push into each other when they bake. Sprinkle wheels with remaining cheese. Bake for 22 to 25 minutes, until golden brown and dough is cooked. Carefully remove each wheel from the pan with a spatula or pie server. 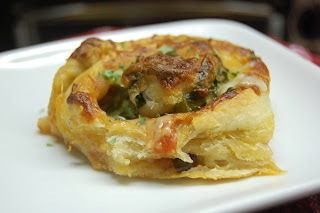 I love the idea of making the pizza into pinwheels! So cool! we made these a few weeks ago and I let my 8 year old make the whole recipe. all 3 of my kids loved it (ages 8, 4, 3) and didn't even complain about eating spinach! Glad you liked it. :-)I'd forgotten about this one. I'll have to make it again soon.